The Lowe cone press, invented and patented by Samuel W. Lowe of Philadelphia in 1856, was advertised as a cheap press for amateurs and tradesmen, with the slogan “Every man his own printer.” It is the oldest of the small, portable presses suitable for amateurs (William Kelsey later positioned his line of Excelsior presses to compete with the Lowe; see Excelsior 3×5) and was used during the Civil War for printing field dispatches and orders. The Lowe uses a revolving cone-shaped roller instead of a cylindrical one; most of these were iron, though some of the smaller sizes sometimes had wooden cones. 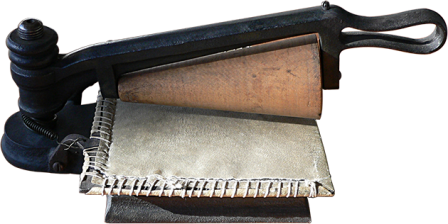 The cone itself was not new in a printing press; John Nicolay had patented a “rotary cone printing press” in 1852. Lowe’s patent therefore specified the impression adjustment mechanism. Two years after he had patented his press, Lowe sold his company to Joseph Watson, who ran the Lowe Press Company from Boston. Watson continued to manufacture the Lowe press until he took over Adam’s Cottage press and then manufactured his own Young America series.